New Interview Promo Debuts; Is VOD Release Happening? 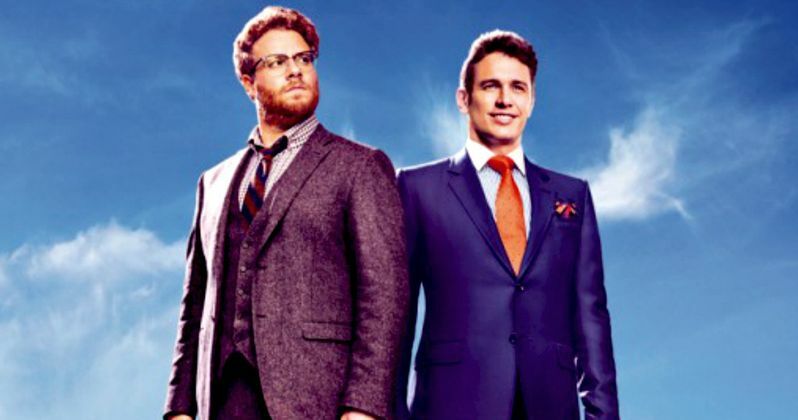 After Sony Pictures canceled the Christmas Day release of The Interview in theaters, and clarified that they have no future release plans for the comedy yesterday, the studio surprisingly released a new TV spot on their official YouTube page today, dubbed "In Franco and Rogen We Trust." What's also surprising is the footage seems edited in a subtle way to address the controversial decision itself, while the end tag still states this will be released on Christmas Day. Unless there is a remarkable 180-degree reverse from theater chains who have a change of heart, it seems likely that The Interview may be released on VOD exactly one week from today. It's possible that the video was uploaded by accident, but it's been on Sony's YouTube page for a full hour and it hasn't been removed yet. However, a more likely scenario is that Sony saw how others in Hollywood reacted to their decision, and decided to release The Interview through a non-theatrical platform like VOD, which Sony was reportedly considering just hours before they canceled the theatrical release outright. The video itself ends with a rather poignant passage of dialogue, where James Franco's Dave Skylark is asked, 'How many times can the U.S. make the same mistake,' to which Skylark replies, "As many times as it takes." There also appears to be brief snippets of footage that takes place right before the leaked death scene of Randall Park's Kim Jong-Un, and there is yet another scene where Lizzy Caplan's character says, 'We have a dictator to kill.' Sony Pictures hasn't released an official statement yet, regarding The Interview's release but take a look at the TV spot below, and stay tuned for more updates.